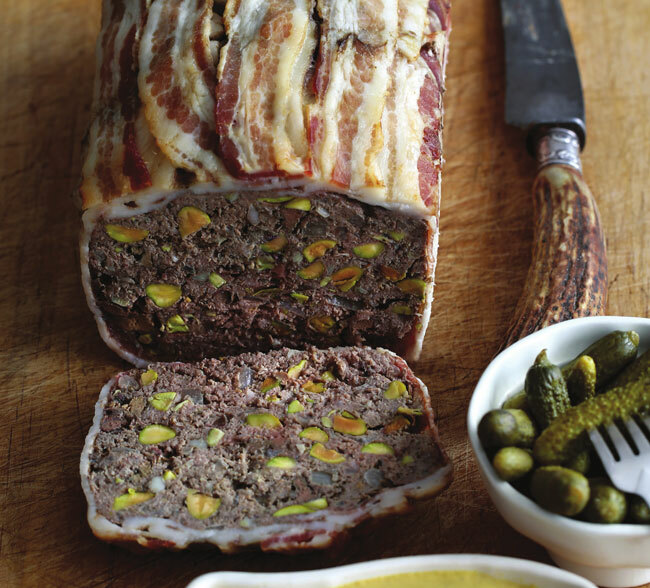 If you’d like to make this pâté for the Christmas holidays, you can use pink and green peppercorns to give a festive look. Other additions could include capers, dried chopped apricots or prunes. ✽ Finely chop 6 slices of bacon and toss in a large mixing bowl. Peel and mince the garlic and shallots and add to bowl. Crush the green peppercorns in mortar and pestle, or very coarsely chop using a knife. ✽ Heat oven to 350° F (180° C). ✽ Line the loaf pan with bacon by laying slices horizontally all the way down the pan with ends hanging over to wrap over the top. Use more, cut in half, to line the ends of the pan. ✽ In the small saucepan over medium-low heat, melt the bouillon cube or beef base in the water. ✽ Turn off the heat. With a fork, beat in the olive oil, flour (1 tablespoon at a time), and gelatin; stir well to mix. Over mediumlow heat, slowly add the cream, stir to mix, and heat until it boils, thickens, and is bubbly. Remove from heat and cool to room temperature. Whisk in the cognac, eggs, and spices. ✽ Add the pork, beef, chicken livers and cream mixture to the bowl and mix well, using your hands like a 5-finger whisk, stirring round and round until the mixture is very well blended. Then mix in the thyme, peppercorns, and pistachios. ✽ Transfer the pâté mixture to the loaf pan, pressing down with your fingers to compress and pack it in tightly. Fold over the bacon to cover the top so that it bastes the pâté as it bakes. Cover the loaf pan with the remaining slices of bacon. ✽ Cover with aluminium foil greased with olive oil and place in the baking dish. Boil water and pour into the dish so that the water comes halfway up the loaf pan. Bake until the instant-read thermometer registers 160° F (71° C), about 2 hours. Check the temperature at 1 hour. ✽ Remove from the oven and cool. Place the brick on the top of the pâté to weigh it down, and place it in the refrigerator for 24 hours. ✽ If you don’t want to use bacon, you can line the pan with parchment paper.